Assured Automation offers the 26 Series and 36 Series silicone free valves for paint and ink applications. Assured Automation’s 26 and 36 full port, stainless steel ball valve series are silicone free making them the perfect choice for the automotive and paint industries as they eliminate contaminants and the resulting finish imperfections. Silicon based lubricants typically used by valve manufactures provide excellent lubricating properties over long periods of time without drying but can create problems if used in paint or ink applications. Most substances will not adhere to silicone, with the exception of other silicone based products, this creates adhesion problems if used in an application involving paint or ink. 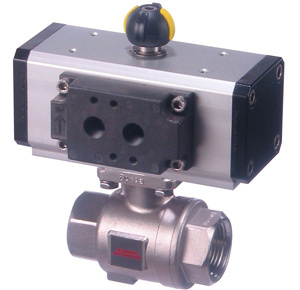 The 26 and 36 Series stainless ball valves are constructed of 316 stainless steel, allowing them to flush easily and quickly.The superior stem seal design of these ball valves provides increased cycle life making them a perfect choice for automated valve package designs. 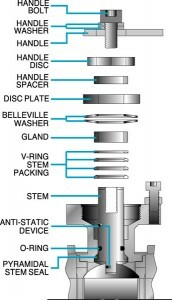 The Teflon stem packing is live loaded with Belleville washers to provide constant tension on the stem seals. This ensures a bubble tight stem seal and increases the life cycle of the stem seals even in high cycle applications. 1st Stage– Pyramidal body and stem seal –Internal Pressure of the valve pushes the pyramidal stem sealing upward. Because of its shape, the sealing expands to fill all the air pockets that might become a potential leakage path in the lower stem area. 2nd Stage Viton® O-Ring- The Viton O-Ring serves as an effective sealing mechanism for medium that might escape the 1st stage sealing. 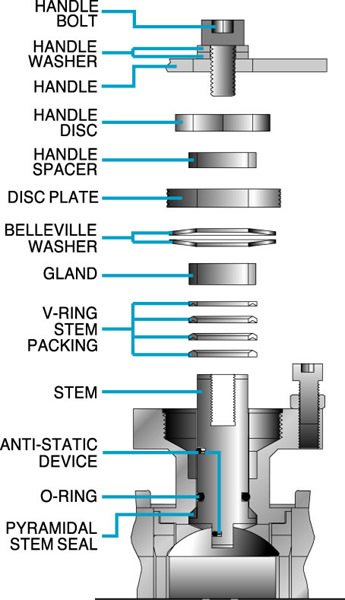 3rd Stage V-Ring Stem Packing –Live loading action of the Bellville washer expands the V-Ring stem packing, filling all the air pockets in the outer stem area. It effectively seals internal media within as well as keeping out external media from entering the system. The 26 Series is available in 1/4″ to 3″ line sizes with NPT threaded end connections. The 36 Series is available in 1/2″ to 4″ with NPT, Socket Weld and T-clamp end connection. 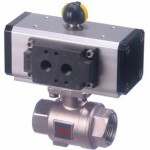 These valves can be equipped with a manual handle or with direct mount pneumatic or electric actuators. 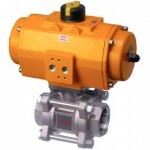 The direct mount actuators eliminate the valve-actuator mounting kit, which adds unnecessary height and expense. A full range of accessory items are available including limit switches, solenoid valves, positioners and manual override devices. This entry was posted in Automotive Industry, Latest News and tagged 2-Way Ball Valves, 36 Series, Automated Valves, Full Port Ball Valves, Stainless Steel Valves. Bookmark the permalink.